Authorities arrested two men on Friday for allegedly attempting to sell 1,500 individual bags of heroin to an undercover detective, according to the Bergen County Prosecutor’s Office. 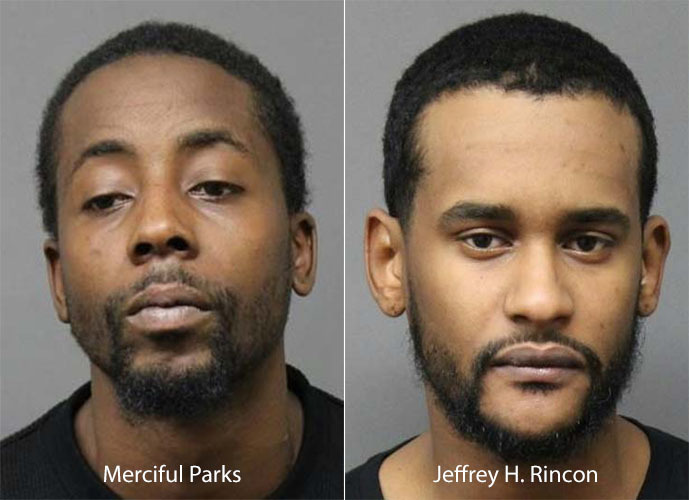 Merciful Parks, 24, and Jeffrey H. Rincon, 28, both of Paterson, were arrested on drug charges in the parking lot of the Garden State Plaza Mall in Paramus, authorities said. Parks and Rincon were delivering 30 bricks of heroin to an undercover detective from the Bergen County Prosecutor’s Office. Detectives seized the heroin valued at $10,000 on the street. Authorities said Parks also had small amount of marijuana in his possession. Police conducted the undercover operation after receiving information in October that Parks was distributing heroin throughout Bergen County. The Bergen County Prosecutor’s Office received assistance from the U.S. Drug Enforcement Agency (DEA) post of duty in Paterson, Dumont Police, and Paramus Police. An undercover detective purchased several bricks of heroin from Parks in October and November. On Friday, the detective made arrangements to buy 30 bricks from Parks. Parks was charged with second-degree heroin possession, two counts of heroin distribution, third-degree marijuana possession, and disorderly person’s offense. Rincon was charged with second-degree possession with intent to distribute heroin, authorities said. He had an outstanding arrest warrant for an unrelated offense. Both men are being held in the Bergen County Jail pending court appearance.